Manufactured By – Warlock Records, Inc. Distributed By – Warlock Records, Inc.
"Specials thanks to Peter and the staff at Rham for all their help. Also, to Al "T" McLaran and Lyndon "Lyndrum" Roach for organizing the War-Party that defends the dance underground"
"Specials thanks to Judy Weinstein for letting us slide for ten dollars. Also, to Al "T" McLaran and Lyndon "Lyndrum" Roach for organizing the War-Party that defends the dance underground"
A medium tempo acidclassic from -88! 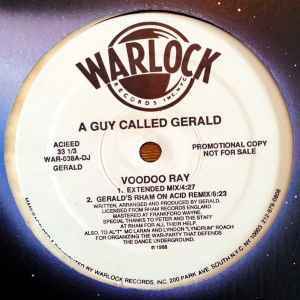 Voodoo ray on Warlock contain exclusive mixes, some very laidback.